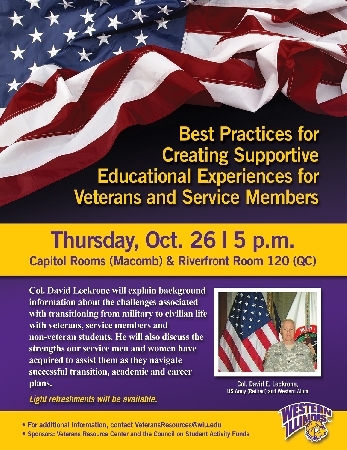 MACOMB, IL -- The Western Illinois University Veterans Resource Center, the Council on Student Activity Funds and CITR will sponsor two presentations by a military consultant Thursday, Oct. 26 at 3 p.m. and 5 p.m. in the University Capitol Room in Macomb and Riverfront Room 120, on the Quad Cities Campus. Col. David E. Leckrone will speak to University faculty, staff and administration at 3 p.m. and to students at 5 p.m.
At 3 p.m., Leckrone will discuss military culture and share insight into how the training, background and experience of student veterans may influence their transition into higher education. He will also provide strategies for helping student veterans and service members as they enroll in and complete their educational programs at Western. Assistant Recreation, Park and Tourism Administration Professor Jeremy Robinett will facilitate the 3 p.m. session. He recently completed a study of military service students attending WIU. To register for this session, visit wiu.edu/CITR/workshops/. At 5 p.m., Leckrone will give background information about the challenges associated with transitioning from military to civilian life with veterans, service members and non-veteran students. For more information about either session, email the Veterans Resource Center at VeteransResources@wiu.edu.